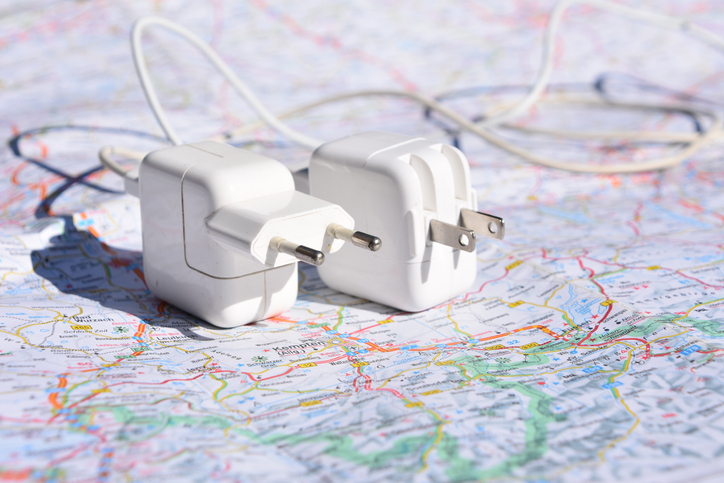 Before traveling outside the United States, check with your lodging provider(s) regarding the specific electrical needs at your destination (many places abroad cater to tourists and use U.S.-compatible outlets). One of the first things to remember is that there are two different types of voltage ratings. The United States and Canada use 110/125V, while most other areas in the world use 220/240V. After verifying the voltage in the outlets at your destination, check the input voltage on each of your devices (look for this info on the cord, plug, or somewhere on the device itself). The input voltage may be single or dual/multi. Single voltage devices won’t work in most destinations outside of the United States without a converter. Dual voltage means there is a switch to adjust for international use. However, most devices made today are multi-voltage, which means they will automatically adjust to a different voltage. Watts measure the amount of power a device uses and is usually only a concern when you bring a high-wattage device like a hair dryer, coffee pot, or heating pad. Converters are used for high-wattage devices, while travel transformers are used for low-wattage devices. Always check the device to ensure your converter can handle the wattage your device needs. Depending on your destination and your devices, you may need to purchase an adapter and/or converter—an adapter changes the shape of the plug so the device can be plugged into the outlet, and a converter changes the voltage of a device to match the appliance’s voltage. Each device should state the amount of voltage that it can handle. Some devices will not need a converter as they can handle both voltages. If a device can handle both voltages, you will only need to find the right adapter. Below find a graphic of the most commonly used plugs throughout the world. The International Electrotechnical Commission offers a list of the most commonly used plugs in each country – including rural destinations. Important Note: Some places of business and hotels have universal outlets that will accept multiple plug types. If your destination has a universal plug, then you will not need an adapter. If you are planning to travel to multiple destinations, however, you should have an adapter packed just in case. Pro Tip: Don’t forget an extension cord so you can plug in multiple items at once! For more information on pre-travel preparation and holistic risk management, contact us today. I have never been able to make heads or tails of all this in my 38 years as a travelling salesman. I couldn’t begin to describe how lacklustre hotels, airports, travel sites and they like are when it comes to this sort of thing. I’m very glad someone has taken the time there to clarify it and make it easy to deal with. The extra mile as always.